First of all I’d like to thank you for being a subscriber. 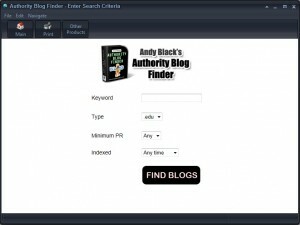 As a thank you I’d like to give you a full months access to a brand new software tool I have recently created called ‘Authority Blog Finder’. There is no additional opt-in…. payment or anything like that. Simply download and use! I’m hoping to release Blog Analyzer v1.5 next month as a WSO which is going to be packed full of features that allows you to find the ‘perefect’ blogs to comment on (not spam! but valuable comments). Whilst I was developing v1.5 I thought to myself… why not transfer a few of these features into a seperate tool and let my subscribers use it to find some high PR authority blogs to comment on. 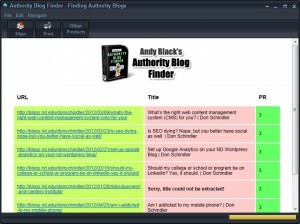 So I did just that, and ‘Authority Blog Finder’ was born. It isn’t anywhere near as powerful as my forthcoming Blog Analyzer v1.5 BUT it will allow you to find high PR .edu or .gov blogs that ‘HAVE’ comments on them… meaning that there is a good possibility that you could also get a comment (and backlink) published. You can choose whether to retrieve .edu or .gov blogs and you can also choose to retrieve blog posts that were only indexed recently. Recent blog posts are more likely to be active when it comes to blog owners checking for new comments. You can download the software here and start using it today. You can use this version for a whole month so ENJOY! Please note that I aven’t had time to add an installer so once you unzip it just run the exe file which is the software. No installation required! It would be great to have your feedback so PLEASE do feel free to leave a comment below. Bear in mind though this this is a seriously cut down version of Blog Analyzer v1.5 but I’m sure you’ll find it extremely useful none the less. Hi, thanks for the gift. Really appreciate it and that’s what’s makes us as the subscribers stays on your list. Love your Spinner! This free gift will surely be a great add on for the WSO. Thanks, Andy this is a great gift and I am sure it will do very well as a WSO! This is a fantastic gift and it is a pleasure to on your list, many thanks again and good luck with the WSO launch. Thanks Andy! I’ll give it a shot and see how things are working. Thank you so much mate for this great gift. I am going to let it rip!!! Thanks Andy. The fact that it is a portable application makes it extra valuable for me! Thank you Andy. You are a generous person and I look forward to trying your gift. Thanks for the gift. This is a blessing as I am just starting out!